Seeking advice or maybe just an opportunity to vent. Last night, my husband of twelve years told me he doesn’t think our marriage is “working.” He feels I don’t really love him even though I do. He has his faults, for sure, but I want this so desperately to work out. This came out of nowhere, we have two small children, and he refuses to go to any counseling or therapy. I don’t know what, if anything, I can do. I’m starting a new job in a few weeks, so this timing is pretty rough. A friend thinks there has to be another woman or maybe he’s having a crisis because this really seems odd. We’ve had some arguments but we’ve had a pretty fun year together. I’m reaching out to a therapist for myself. What are some of his examples for when he thinks you don’t love him? Is his definition of love perhaps different from yours? Is he looking for more passion whereas you are okay with companionship? I would ask for clarification and maybe it wouldn’t change anything but it’s better to know. Hugs, sorry for the tough situation. It seems he expects that marriage should be easier and not take as much work. I guess I’m more pragmatic. I think he expects the fairy-tale romance and passion. Thanks for the response. I’m so sorry. I’ve been there, though we were not married as long as you and did not have any kids. There may or may not be another woman, but I think the crisis is self-evident: he’s abruptly telling his wife that the marriage “isn’t working,” and she had no idea. Something is obviously wrong, somewhere in his life. He’s refusing to go to counseling–what IS he willing to do? Is he presenting this as a done deal, or asking for some kind of change? Is the change he wants nebulous and/or totally on your shoulders? Are you supposed to figure out what’s wrong and fix it, all on your own? Thoughtful advice as always, Monday. It’s odd. Not sure if he is presenting this as a done deal, but it felt like perhaps he was. Will ask for clarification. He seems to think he has been working to make our relationship better, but I just don’t see it at all. Thanks for the response. Oh boy. I just saw your comment above, to the other poster–that he says he thought marriage would be easier. Unfortunately, this is tracking closely with what my ex-husband said to me. Eventually, he did go to counseling, alone and with me, but I think by that point he had decided he was done. I don’t regret doing it, but looking back I don’t think it was ever going to accomplish anything. So if this is your situation, going to counseling on your own is ideal. Focus on yourself. I have never figured out what was really going on with my husband, or whether someone else was in the picture. It’s no longer relevant at all. But someone who is saying “this is too much work” is essentially saying “this is more work than I am willing to do.” You can’t debate that, and it’s unfair (and impossible) to just try to take over all the work yourself. I did that for a while, and it was deeply demeaning and painful. There’s also the possibility that “work” is also literal–i.e. he expected that you would do most or all of the chores once you were married. I think many guys hold this hope without admitting or even realizing it. I’m so sorry. Keep checking back in with us. Will do. Thank you so much for your responses. Nice to feel like I am not alone. You’re not alone. Lean on your friends and family, and keep yourself busy/distracted if you can. FWIW, my husband and I had a similar moment, and in the end, it basically turned out that he was terribly depressed. He didn’t feel able to contribute to the relationship (doing pretty much anything felt like too much effort to him at that point) and because it wasn’t easy he felt that he was a burden on me, and that the relationship wasn’t “worth it.” He also refused to get counseling (which, given the depression, is a current and ongoing problem for us) but in my case it ended up being an entirely different problem from what I’d initially thought. Whatever is going on with him, though – sending internet hugs to you. Going through this is really rough. +1 it may be something in his life. My spouse thought I didn’t love him after we had our first kid. Suddenly, I wasn’t able to meet his needs and wants to the extent I was pre-kids. His expectations were unreasonable (though I admit I had been enabling them). It caused a lot of fights and a radical change in our marriage. I hope your marriage survives this, but please don’t blame yourself. Thank you. I hope we can survive, but hard to tell what he is really thinking at this point. Thank you for responding. I’m so sorry. I’m in the same boat. He says he loves me but there’s not enough passion. He just moved out and is living with another woman. Sending you hugs from this internet stranger. I am so sorry. Hugs to you as well. Ugh I’m so sorry. That’s terrible. Regardless of whether there is another woman, him coming out and saying that it isn’t working and his refusal to go to therapy are really telling. It doesn’t sound like he even wants to work on things. As Monday says, what is he willing to do and what does he expect you to do? This just sounds so immature and hurtful. I’m so sorry you are dealing with this! I’ve been pushing for therapy for a few years and just do not understand his aversion to it. Thank you for responding. My husband did the exact same thing last Spring. We had been together for 8 years and married for 4 years at the time. I initially thought he was depressed due to him not being completely honest with me about the issue and phrasing it as being unhappy with life in general, rather than being unhappy with me/our marriage. After seeing his primary care doctor and a therapist alone, and being honest with them, he told me that he was unhappy with our marriage and felt like I didn’t love him. I told him we were going to therapy, but we only ended up going together twice, I went alone one time, and he went alone twice. During those sessions, the therapist told him that this seemed to be a perception issue on his end, rather than me not loving him or there actually being issues in our marriage (we regularly go on date nights, communicate well, have a good s*x life, etc.). He was never able to give me or the therapist concrete reasons for why he felt that I didn’t love him.The therapist recommended he continue individual therapy since it was a “him” issue and not a “marriage issue”, but he wouldn’t make any more appointments. He owned that it was his issue and seems to have worked through it, as things have been better since then, so I didn’t push the individual therapy. I actually don’t think there was another woman in our scenario. It seemed to more be rooted in him having an identity crisis in that he was expecting me to fulfill all of his needs in life and that isn’t a realistic ask for a spouse, so obviously I was falling short of that bar. He dropped most of his friends he had when we met because they never grew up and now have drastically different lifestyles than he does, and he doesn’t have any hobbies or interests outside our family and work, whereas I have several groups of friends I see regularly, am involved in volunteering with a bunch of organizations, and have ties to our church (in addition to my job and family). No real answers, but maybe my experience can help you. Yikes, I’m so sorry. This is really rough. My ex-H did something similar. He was kind of a mess and I had taken a lot, but we hadn’t been to therapy. He was really unhappy about returning to N.O. after Katrina, but he was unemployed and I couldn’t support him to stay up north (financially) when I had been supporting him for over a year. He suddenly announced that he was leaving and that he was “just done” and wasn’t interested in going to therapy (despite the fact that he *is* a therapist). In retrospect, there were a lot of things wrong with our marriage and I was more unhappy that I allowed myself to believe at the time. I wanted him to get it together and figure out what to do with his career (without getting yet another degree). I didn’t allow myself to realize how smothered I felt until I was out from under it. Based on my own experience (and really only that), I might recommend that you go to individual therapy just so you can work through some of what he’s saying and figure out, for yourself, if any of it is true. It might also help you get some insight on yourself in the relationship. It couldn’t hurt. Oof. You aren’t alone at all. Last year in September, my husband of 12 years told me that he was potentially leaving me for many reasons, including that he thought I didn’t love him and that I wasn’t putting enough energy into the relationship. He soon admitted there was another woman, but blamed it on my alleged lack of caring about him or the relationship. I thought we were happily married and I was taking active steps toward fixing certain issues (got a new role at work that didn’t require travel, for example). He refused to get marriage counseling (we’d been 7 years before and thought it helped). I told him I wanted our relationship to work and if he would cease all contact with her and work on the marriage, I really wanted to do that with him. Several days later he finally said he didn’t want to work on the marriage because it wasn’t working. I refused to make the decision for him but agreed to throw myself into working on it if he would too. I would encourage you to go to your therapist ASAP and also let your friends help you through this. It seems others’ marriages made it through such a crisis, but mine ended in divorce. I’m happier than I’ve ever been now, but it was a rough road to be blindsided like that. I hope that’s not too much of a downer, but I really do think you should be prepared for the worst. Reading through everyone’s comments on this one has been really helpful. I feel like I’ve been in the spot of the guy, feeling like I’m just not loved enough or things weren’t working out. However when this kind of stuff boils over currently, me and SO talk it out. I am reminded that this kind of open communication about our relationship problems is extremely important to do before things get too far. The other thing that has really helped us with these kinds of problems was discussing our love languages. Kat, this is a great laptop tote and for less then $300 for REAL leather, I will get it. I got a new MacBook Air, and this will fit it well. I hope the manageing partner will just let me keep the old MacBook Pro b/c the teck guy says he wants it to give to his 8 year old, but I have a lot of links there and cookies that I will loose if I just let him take it away. Besides, there are personal pictures on the machine I sinched from my iPhone that I do NOT want him or anyone else to see. FOOEY in the tech guy b/c he loves to stare at my boobies and that makes me VERY self concius. DOUBEL FOOEY! Recently, my dad has started making comments that make me think that he expects me to be a SAH mom or at least take significant steps back from my career once I have kids. I don’t know if this was always how my dad saw life and I just never picked up on it, or if it is something he has felt more strongly about as he’s gotten older. I am an attorney, and so is my dad. My mom is currently a lawyer but stayed at home when we were little and hated it. My dad actually is the one that encouraged me to go to law school, but as time has gone on, it has become increasingly clear that he does not really take my career seriously or take me seriously as a lawyer. Examples include him making comments like “women can’t handle being lawyers once they have children” and saying my brother (also a lawyer) getting a good job was more important than me getting a good job since he would be the “provider.” Also, while I was looking for a job, he did not introduce me to anyone in litigation because it wasn’t “my type of law.” I am now a litigator. Last time I was home, I literally sat and listened to both of my parents sit and judge people that hired nannies, left kids with the grandparents while they were on vacation, etc. I eventually told them me and DH were going to do all these things and just left. I realize that these types of comments are only going to get worse once me and DH actually have children, and my dad has no control over these types of decisions for me and DH. (My parents are in another city.) But these types of comments really bother me more than I thought they would. My dad had always been proud of me doing well academically growing up, so this just seems like a big change for me to deal with. Has anyone else dealt with this? Do you respond? When you get so sexist dad? Wow that’s straight out of 1850? I normally do respond, but sometimes I don’t. I think what bothers me most about these comments is that they are not something my dad thinks could possibly be offensive. We got in a big fight about the comment about my brother’s job being more important than mine, and his reaction was just kind of like that he didn’t mean anything by it and would never want to offend me, etc., etc. So, in other words, belittling my reaction. This past weekend a lot of these comments came up as we were watching a football game, and I really preferred to watch the football game instead of picking a fight. My mom did pick up on a few of the things my dad said as being probably offensive to me actually. But, like here I am 5 days later, still thinking about this and regretting saying something, and my dad probably doesn’t even remember this conversation. There’s a difference between your dad being baffled about why you suddenly reacted so strongly and your dad not understanding that something could possibly be offensive. I’m guessing these are ways that he has always thought. From his perspective, it’s possible that he thinks he simply made a mild comment and you flew off the handle and overreacted to it, and he didn’t mean anything by it and wasn’t saying anything about YOU, personally. Obviously, that’s not the way you see it. But you’re right, picking a fight during a football game isn’t the way to deal with it. Since you’re all lawyers, I assume you’re used to clear and logical thinking? Could you have a conversation at some point where you logically lay out the case for why this perspective could be offensive? Then, you’re dealing with the perspective itself, and he’s not in the position of thinking he just needs to mollify you and get you to calm down and make you feel better. Not lawyers but yes my parents are smug about my mom having stayed home with us, pride themselves that they can count on one hand how often they got babysitters, etc. My brother is basically not an adult in any way but I don’t bring up the connection. Neither of us had kids but I’m sure the hints and questions would have come up. No advice but I get it. I guess you need to get your boundaries fortified. I think when he saw me as a “girl,” my success reflected well on my dad, so he was proud of me and very supportive. This support definitely did not extend to me actually entering his world as an adult professional. ^Classic sign of narcissistic parenting. I had a similar experience with my parents. My dad is a straight-up fossil. He seems vaguely aware of how laundry is done and how food is procured to eat, but I’m not sure he could survive on his own. A difference may be that I don’t have brothers and I married relatively late, so he has always seen how hard I have had to work (as a lawyer, he is an engineer). I had kids later and had to juggle my practice while on maternity “leave” b/c I am was a solo then. My SAHM sister abandoned her career and then got kicked to the curb when my ex-BIL decided he wanted out after having an affair (even though he had 4 kids at home still). You know what’s harder than being a working lawyer with kids? Restarting from scratch in your 40s with a tons of kids who get sick in the winter and you get no help from your ex. Or a friend of mine has a spouse with a degenerative disesase (huntingtons?) — spouse is now in a nursing home to get 24-hour care and someone still has to go to work to pay the bills. You just never know. We are a car crash away from a calamity and we all may need income + medical insurance so that we don’t outlive our $. Ugh — what I never finished saying is that even though my Dad is a fossil, I think having only girls has helped him see the world with new eyes. He sees how hard I have always had to work. And he sees how hard my sister is having to work to keep a roof over her head and her children’s heads. I think he gets it. But statistically, I wouldn’t have guessed how far he has come. He’s not a litigator — maybe he should go to work with you for a day to see how things are. I don’t know what the answer is, but I hope you find it. That is my biggest worry for my SAHM friends, that or that a major accident befalls their partners. Not all of them can bounce back into the working world easily either. I have one work friend who I had to teach to add columns in excel yesterday. She’s been back at work for 3 years. I would say something in the moment when he says something particularly egregious (Good to know you’re proud of me dad! ), but honestly, I think you’ll get more traction if you work on caring less about these comments. It’s really hard to do, but, changing people’s minds is harder, IME. Ugh, my dad made a couple of comments like that when I was pregnant. I did not indulge him as I had no plans to stop working. He hasn’t said anything since then, but within the last year (my son is 3 so I’ve been a working mom for a little bit) his wife made a comment like “are you sure you’re going to keep working?” Um yes. Nothing you two can say will make me change my mind. It didn’t bother me as much as it seems to bother you and I basically ignored the comments and went on with my life. For many reasons, I try to keep some distance between us. I think part of why it bothers me so much is that my dad (and sometimes my mom tbh) get so judgey when they talk about other people’s parenting choices, and almost everything they say about these other random people will also apply to me in the near future. What do you think they would do if you’d tell them this? FWIW my SAHM was super judgey about any non-mother childcare. I have 3 kids and I just informed her This Is How It Is. she adapted just fine. She’ll occasionally comment that it’s a shame my 2 y/o is in 4 day 9-5 care (“it’s so long…”) and yet, she’s thriving and so is my career. We’re not lawyers, but I’ve noticed a similar descent into misogyny with my dad. I’m an engineer, and he was always bragging that I was in the advanced math classes in high school, that I went to a good college, that I had a great career, etc. Now he’s saying that my mother should have homeschooled me (Mom divorced him years ago, btw) because the public education system is full of liberals. I don’t have any advice, but if someone else gives you some, I might take it, too. He makes cruel comments (“you’re looking heavier”) that he thinks are just observations or making conversation. If I get upset, then I’m hormonal, and in the good old days women didn’t have this attitude. I think he’s alone and retired and watches too much TV, and is scared of the world changing. He doesn’t know how to process the things that are happening. Living alone, he doesn’t get a lot of practice dealing with people anymore. Who wants to tell me about where their favorite watch came from? No budget, just trying to get a sense of brands. Skagen. It’s not fancy but it is pretty. I like their aesthetic and the band is comfortable and highly adjustable. I love my Skagen watches — their minimal, clean faces are exactly my preference. Skagen here. I have small wrists and they have a few options that don’t make my arm look like it was swallowed by a watch face. I have a fun Kate Spade watch that I wear to work every day. Fossil – they are the makers of all the fancy Kate Spade/Michael Kors watches. Basically the exact same watches for much less. Shinola Gomelsky, with a malachite and sandstone face. Bought if half off retail from ebay though – it is very pretty, but I don’t think I would have paid full sticker price. I have a Pulsar watch that I purchased in 2001. Classic, silver colored. Not trendy, obviously. But it works! Looks professional! Tells time! I think I paid under $100 at the time. Mine is a very basic Bulova. I’ve worn it every day for 6 years and it’s held up amazingly well, especially considering it was only about $300. It’s nothing fancy, but it’s plain and polished-looking, which is exactly what I wanted. I have a Citizen Eco Drive. I love that it never needs batteries. I have one as well. It’s seven years old and still going strong. I think I have 3-4 Skagens? I have a small white one for summer, but most of the time I wear a bigger face with crystals around the edge and a mother-of-pearl face that was one of the last Christmas presents my dad gave me. I still have my original one (very plain with a mesh band) and a brown mesh with kind of yellow crystals that I haven’t worn in years. I’ve thought about getting one in a charcoal mesh (to go with my many gray clothes), but I can’t let go of the one my dad bought me. I have a small men’s Tag Heuer that is 27 years old and still going strong…worth every single penny several times over by this point. I have a Breitling that I bought secondhand and really love. I have my eye on an Omega Speedmaster though. I also have a very basic Skagen that’s a great watch too. ah, I have a men’s rolex day just that I wear nearly everyday. I absolutely love it! 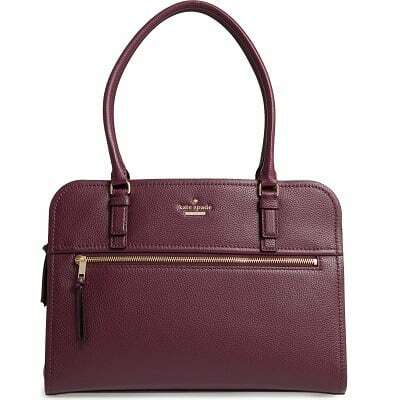 I have a different Kate Spade purse in this color and love it. It goes with almost everything. The communications department at my organization just nixed a request I received to do an interview with some students in my field. TBF, the interview request was specific to my affiliation with my org, so I did need to clear it with communications. My question is, what do I say in the email refusing the request? My field is small, and I need to keep networking with the university. How much can I blame it on policy? On the powers that be? Does that look less professional, since I’m not owning it? But friendlier, to acknowledge that I would prefer to help? Can you just give a generic “I’m sorry I won’t be able to make it work”? I don’t know that throwing your employer under the bus is the best idea. I’m in a university comms department, and refusing a request to interview (especially with students) would be a rare event. I’m curious about what the reasoning was — although I would NOT share it with anyone. Any chance the university is not on board with this particular professional association or has a relationship with a competing one? I’m not at the university–I’m at a government agency, and the rationale is that I can’t answer questions according to our policy because we don’t have a formal policy on the topic. It’s an…interesting response…but apparently a common one. Are you a fed by chance? My agency has 100% locked down external speaking except for political appointees. I’m at a gov org, not the university. The logic is: I can’t appropriately follow policy in my comments, because we don’t have a policy on the topic. I’m not sure the logic makes sense to me…but I’m sure the decision was made by the right people, who are not me. I think you can 100% blame it on communications, since they nixed it. I work in comms, fwiw. Thank them profusely and honestly, and say briefly that your company did not agree to it. Then state what you are able and willing to do for the university. I work in a media relations shop in government — your comms shop should be willing (or may even insist on) declining this for you. People who did Masters degrees (not MBA) – when did you start applying to jobs? Im interested in a particular national organization that occasionally has a position that I’m suited for open, but it’s unpredictable when. It depends, but they seem to be looking for applicants every 6 months or so. That position is up online right now. I don’t graduate until June. Should I apply now and if I get far either a) try to postpone the start date or b) figure out who to reach out to to apply later, or just wait for now? Tbh I’m currently feeling a little bold because I replied to the “are you interested” form for a job I’m not qualified for, and received a reply indicating that I might be able to get involved in a part time role. I’m in a less traditional role, not at all as rigid as banking/consulting/finance. Apply, it can’t hurt. They can let you know if they need someone right now or if they have some flexiblity on start. Also are you still completing coursework or doing a thesis or anything? If you’re not doing coursework, totally say that in your cover letter. My last semester of my MS, I was just writing my thesis so I could have started work sooner than graduation date if needed. I wound up getting an offer for a job in early June but I didn’t graduate until August, and my employer asked me to wait to start until after graduation (partially because I got more $$$/started at a higher level with a Masters). I still have coursework. I could work part time, especially as the role in semi-remote anyways, but I would have classes. Yes, definetly apply. Some jobs have a 6 month hiring period, and some jobs will wait for you to start when you graduate. Also, depending on your program and your classes you might be able to work with your professors to telecommute. If it’s a great opportunity, apply now and worry about the timing later. Especially if it’s an academic job, academic jobs usually post during the fall a year before the semester you are going to start (say you would’ve already applied if you were going to work in fall of 2019). And if this job is a masters level job that has anything to do with the academic cycle, they might have a similar trajectory. Another question about the new moderation policy: is there an issue with using the same “name” or email address from two different computers? I usually use my phone at home and my work computer (at work, obviously), often to post clarifications on my own thread. Is that why my email isn’t getting my comments through? NYTimes has a great Smarter Living article today about the stress gap and the imbalance of housework – including emotional labor – shouldered by women. Link in next message. I agree it’s a problem, but those “solutions” are almost worthless. Self care, therapy, etc only add more work to an already full plate. And “seek validation” may help you feel like you’re not making it up, but that doesn’t fix anything. The solution is for MEN and partners to pick up more of the slack. Also for society to change and recognize the value of a home life (thinking of all those 75% travel, 60+ hour workweek jobs, or those 40 hour jobs that don’t pay enough to live on requiring a second job) but that’s even less likely. Which means the generation currently raising sons needs to have these conversations early and often with both genders, instill this value in both, and encourage both to settle for nothing less. Daughter needs to require active partnership from her partner, son needs to proactively partner. And then we all need to advocate for it in the workplace and society. I do not yet know how marriage will work out, but on day 2 of dating my almost-husband, I told him that I would not tolerate being held to perfection or drowning in misery and stress over stupid [email protected]#!. I’m not going to do it all perfectly with a smile on my face. But I am not going to be a rude, sloppy mess either – I just expect that as a couple, we would establish reasonable expectations of what should be done and what can be safely pushed off for a future date or not done at all.